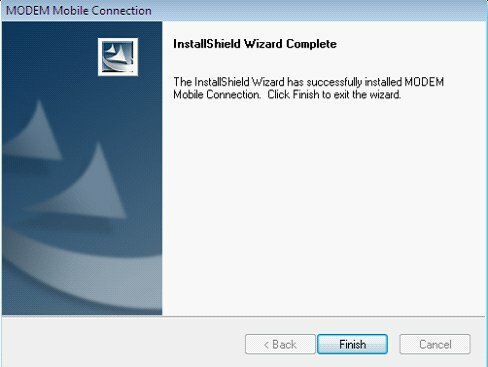 ZTE WCDMA DATACARD support Windows 7 operating system, please download the Windows 7 driver package exe. Installation file: ZTEDrvSetup.exe. Note: please firstly install UI program of Modem, then install Windows 7 driver package. 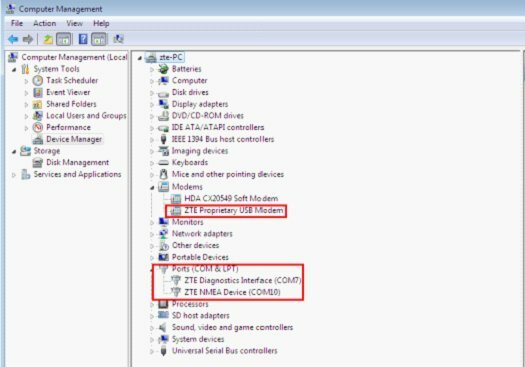 2.1 Insert Modem to PC with windows 7 operating system, the data card will automatically start the UI installation process as Fig 1. 2.2 Following the prompt to finish the installation, the interface for installation completed is as fig 2. 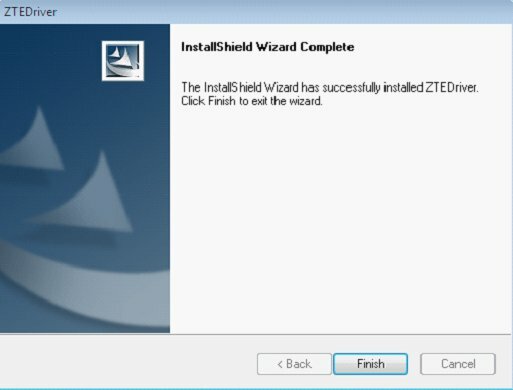 2.3 Double-click windows 7 driver package: ZTEDrvSetup.exe, the installation interface is as Fig3. 2.4 T he interface for W indows 7 driver package installation completed is as Fig 4, click "Finish" to complete installation. 2.5 From "Start" ->"Computer", right click"Mange" to find"Computer Management", click"Device Manager", search Modem and Ports(see red mark), as Fig 5. it means Windows 7 driver package installed successfully, now you can normal use the Modem. 3.1 I f Windows 7 driver package is firstly installed, the UI program can't be installed , how to solve the problem like this? 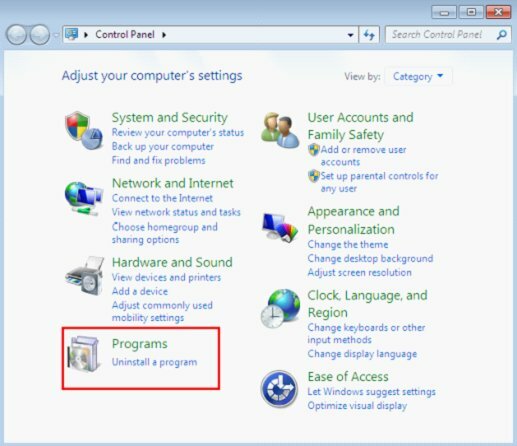 P lease firstly uninstall Windows 7 driver, then install UI program firstly , and then install Windows 7 driver, as the specific installation methods, please refer to the "Windows 7 driver package installation steps". 1)From"Start" ->"Control Panel", click"Uninstall a program" . As Fig 6. 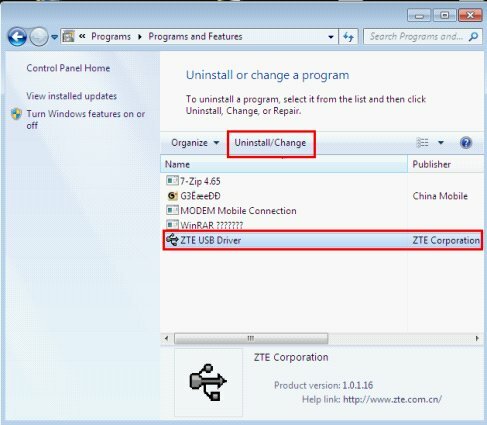 2) selected "ZTE USB Driver", click"Uninstall /Change", to uninstall Windows 7's driver. As fig 7. 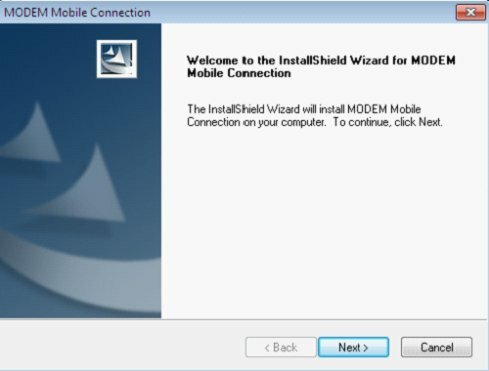 3.2 After UI program installed completed and plug out the Modem, does the Windows 7's driver package can be installed directly? You can install Windows 7's driver directly, please refer to the "Windows 7 driver package installation steps 2.3" to see the specific installation methods.